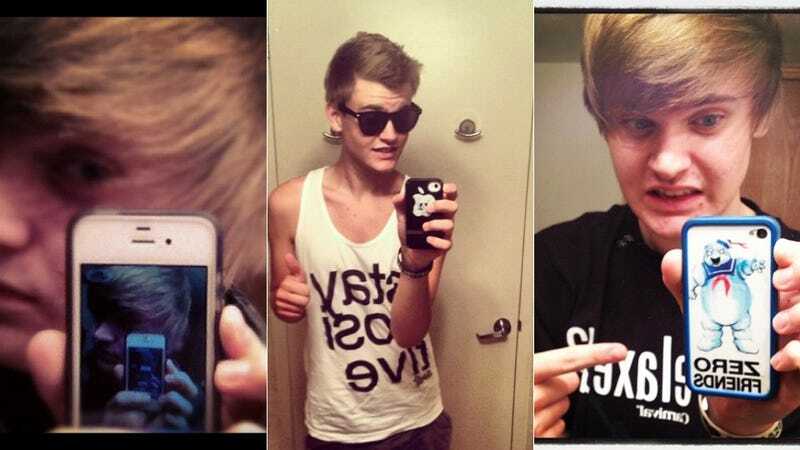 17-year-old Justin Bieber look-alike Austin Wierschke, of Rhinelander, Wisconsin (and a native of the United Kingdom? ), is $50,000 richer today—thanks to his speedy-quick thumbs and unfailingly accurate dexterity. He's a two-time prize-winning SMS champion, ladies and gents, the fastest in our great nation. A noble talent undeniably deserving of large piles of cash. The eight-round competition, held in NYC's Times Square, tested for three factors: speed, accuracy, and dexterity. All 11 competitors were given extra challenges, like texting while blindfolded, or texting with their hands behind their back. Also, weirdly, the contestants were not allowed to use touch-screen phones! It's 2012 for crying out loud. For Austin, who based on photographs is an iPhone man, to win despite this...erm, handicap—well, that's maybe the most impressive part of the whole story. LG, who sponsored the contest, provided each contestant with an LG Optimus Zip (an Android phone with both a touch screen and a slide-out physical key-board), reports Joanna Stern for ABC News. Austin tweeted his victory from an iPhone, however. Tsk tsk. Is this almost more ridiculous a contest than a kiddie beauty pageant? I don't know! Here's a better question: What will Austin do with his prize money? Surely this kid has an unlimited text plan on his phone contract, and that only accounts for teensy fraction of the loot. A quick shuffle through his Twitter count pulled up this glowing example of Austin's prize-worthy (NSFW) texting skillz. Artfully crafted emoji, Austin, A+! Update: Austin's Twitter and Facebook accounts have been removed since the time of publication, because of alleged embarrassment certain content may have caused his family.